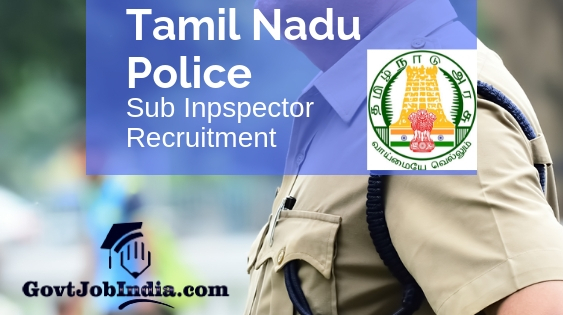 The Tamil Nadu Uniformed Services Recruitment Board (TNUSRB) had issued a recruitment notification for the appointment of 969 Sub Inspector posts in the Taluk, Armed Reserve and Tamil Nadu Special Police departments. Candidates are invited to apply online for the TNUSRB SI Recruitment 2019 from the 20th of March 2019. As this is the starting date to apply, you are advised to submit your candidature as soon as possible because the institution will only be accepting these till the last date to apply which is 19th April 2019. Additionally, please apply online only after checking all the parts of the eligibility like the TNUSRB SI qualification, salary, age limit etc. You will be able to apply online from the link given below. We have also provided the address of the official website of Tamil Nadu Uniformed Services Recruitment Board which is www.tnusrbonline.org. Furthermore, in case contenders have any doubts related to this TN Sub Inspector Vacancy 2019, the GovtJobIndia.com Team has attached the official PDF in the “Important Links” section. You can browse through the Tamil Nadu SI Notification and clear it yourself or leave a comment below for us to clear it out. Please note that we have also compiled information about the TNUSRB SI Syllabus, Admit Card, Answer Key and Result on their respective pages. You will find them at the very bottom of the article. The TNUSRB Recruitment 2019 is a splendid opportunity for all those who were searching for a police job in the state of Tamil Nadu. You are urged to not waste this opportunity and apply online as soon as possible. The various cities where the recruitment will be conducted are Coimbatore, Tirunelveli, Trichy, Chennai and more! So, now that we have discussed the prospect of this job and what it can give you, make sure to skim through the recruitment details. For more information regarding the exam pattern, please visit TNUSRB Sub Inspector Syllabus 2019. How to Apply for Tamil Nadu USRB Vacancy 2019 Online? The application process can be initiated by visiting the official website of the Tamil Nadu Uniformed Services Recruitment Board www.www.tnusrbonline.org. Alternatively, you can go to the link given below. Make a new id in the TNUSRB registration. After successfully making an account, start by filling your TNUSRB SI online application form. Fill in the application form all the details asked, precisely without making any errors. Next, upload your photograph and signature along with the documents required. Proceed to pay the application fee and you have conveniently applied for this recruitment. How was your experience with GovtJobIndia.com team with regards to the article about the TNUSRB Sub Inspector Recruitment 2019? Did you find all the information and its presentation worth your time? If yes, make sure to share this article with all those who might be thrilled to find out about this TNUSRB SI vacancy 2019. Additionally, all doubts and requirements can be left in the comments section. We will get back to them as quickly as we can. Summing up, do not forget to subscribe to our website @ GovtJobIndia.com for further updates related to any new govt recruitment in Tamil Nadu.